Noah loves to swim. He loves it so much that he spends the majority of every day pointing at the door, rubbing his little belly (the sign for please). Noah points to the door and rubs his belly. We open said door and he bolts out. His first destination is always the swing. He runs right past the pool, eyeing it thru the corner of his eye, making a mental note that he will be back later, and then, thru the gate and on to the swing. He could stay in that swing all day watching the clouds......but he usually remembers his mission and wants to get down after a while. Next stop......slide. Another favorite. He climbs up his little rock wall ladder, giggling and babbling the whole way up. He pushes himself off the top of the slide and regulates his speed with his feet and hands. He nails the landing every time with his little knees locked and his arms up and then he claps. He reminds me of a gymnast going for the gold. He does this at least 3 or 4 times before we move to the next step in his mission......the sand pit. This stop, I've figured out, is made because, besides the fact that he really likes the way the sand feels in his hands, he knows that once he gets it all over him, we will dip him in the pool when he's done to get all of it off. It's a very well thought out plan. He goes to his favorite toy on the swing set first and works his way down to the one he knows will earn him a trip to the pool. That way, you see, he gets to play on every toy. Pretty ingenious if you ask me. On one particular day last week, his mommy decided to forgo the usual steps and bring him straight to the pool. And to make things even better, mommy got in with him!! Excitement all around!!! She was taking him off the step that he usually stays on and swinging him in the water and throwing him up in the air. The joy on his face was priceless. 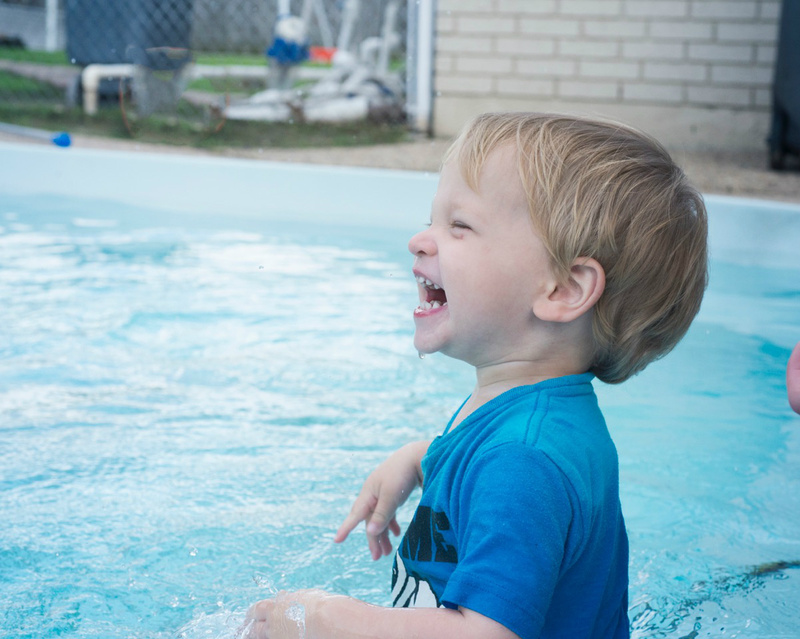 He was grinning from ear to ear and letting out screams of laughter that only comes from being in the pool with mommy. He was jumping from the step inside the pool to the waiting arms of his favorite person. He did this over and over again with the delight that only a 22 month old can, or will, show in front of other people. The water on the step is about waist high to him and eventually, that wasn't doing it for him anymore. He decided to up the ante. He climbed out of the pool, turned around to face mommy, bent his little knees, stretched his arms out as far as they would go, steadied his little body and "jumped" off the edge into mommy's waiting arms. That little baby could not have been happier for himself. If I thought his smile was big before, I was wrong. He must have climbed out of that pool a hundred times, laughing and giggling and screaming the whole time. Every time he got out Sara would say "Again, Noah?!" And he would go again. I looked at Sara and she looked at me and she asked exactly what I was thinking. "Did he just say 'again'?!" He had said his first word. He said it again that day but the first time was the one I will remember forever. That five seconds in time will always be frozen in my mind. Needless to say, she did what he asked, and caught him again.....and again. I was the proudest G-Maw in the whole wide world. Of course, I was so proud of Noah. That's who I was most impressed with. I watched as my little girl had patiently, calmly, and quietly, for almost two years, tried to get her beautiful little boy to talk. It is now my favorite word in the English language.